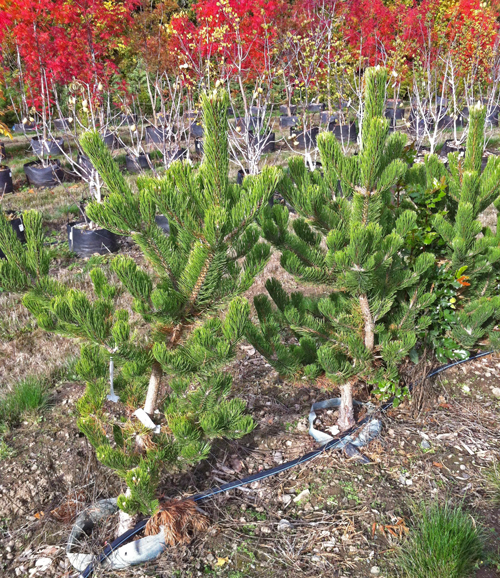 This cultivar of European Black Pine grows slowly, reaching 10-12 feet tall with an 8-10 foot spread in the first ten years. Can reach 18-20 feet tall at maturity. Beautiful, dark green needles are accented nicely with tall, white-ish spires of new growth in the spring that's often compared to tall, white candles. Our 'Oregon Green' specimens grow to have gorgeous, open branching that is perfect for use if you want to accent your ladnscape with a touch of Japanese Garden flair without obstructing part of your view. Plant in a hot spot where you want a nice accent. Conifer Size 1 gallon4 ft.